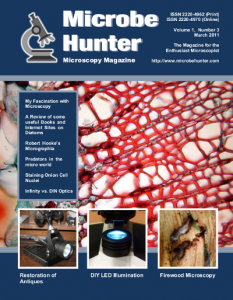 Welcome to the third issue of MicrobeHunter magazine. You can download the PDF and order a printed version. This photo essay documents sample extraction and microscopy of fungi found in fire wood. Joseph Wilhelm shares experiences and lessons of restoring antique microscopes. Don’t throw out your broken microscope just yet! It may be a good opportunity to try out LEDs. Are you interested in diatoms, but do not know where to start your research? Here is a collection of books and Websites. Observing an attack of the ciliate Litonotus. A staining method using regular fountain pen ink. In recent years many large microscope manufacturers moved away from the traditional DIN standard to so-called “infinity corrected” optics.